The Gwedat’sih Day Use and Boat Launch at the North end of Chilko Lake are now open for the fall season. The Gwedat’sih Campground at the north end of Chilko Lake remains closed for the remainder of the season due to increased bear activity along the Chilko River corridor. On June 26, 2014, the Supreme Court of Canada (SCC) granted the Tsilhqot’in Nation a declaration of aboriginal title. Aboriginal title includes the right to exclusive use and occupation of the land, as well as the ability to determine the uses to which the land will be put. The map to the right shows the land that is subject to the declaration of aboriginal title. The Province is currently analyzing the SCC’s decision, and is in dialogue with the Tsilhqot’in Nation about access to Tsilhqot’in title land. Until further notice, persons interested in access to the Title area for camping and associated recreational activities are encouraged to contact the Tsilhqot’in National Government (http://www.tsilhqotin.ca/). Ts’ilʔos (pronounced “sigh-loss”) Provincial Park comprises rugged mountains, clear blue lakes, glaciers, alpine meadows, and waterfalls. It is bordered by the rugged peaks of the Coast Mountains to the west, and the dry Interior Plateau to the east. 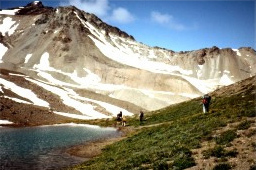 The diversity and contrast in landscapes and vegetation are a result of a rainshadow effect on the east side of the mountains. While the northern and eastern portions of the park are relatively dry, the south end of Chilko Lake is characterized by moist areas of the coastal western hemlock zone. The provincial park was established in February of 1994 as a wilderness area set aside to protect vegetation, wildlife and fish habitats, cultural values, and special features. The diverse ecosystems in the park remain largely undisturbed by human activity, making this park an ecologically significant area in the province. Chilko Lake, the largest, natural high-elevation freshwater lake in Canada, dominates the park. Stunningly beautiful, due to its blue-green hues and dramatic mountain backdrops, Chilko Lake is popular with boaters, kayakers, and anglers. Backcountry hiking and camping is also a cornerstone of the recreational opportunities offered by this remote park. Note: Ts’ilʔos Park is co-managed through a Memorandum of Understanding between BC Parks and the Xeni Gwet’in First Nations Government. Ts’ilʔos Provincial Park is remote. Visitors must be self-sufficient and competent in order to deal with the challenges of the outdoors. BC Parks does not provide rescue services. Only experienced boaters and kayakers should attempt Chilko Lake, due to the unpredictable winds and other challenges such as high waves, icy waters, and a shortage of safe landing areas. Canoeing on Chilko Lake is not recommended. Ts’ilʔos Provincial Park is located in a relatively undeveloped and isolated part of the Chilcotin. As the crow flies, the park is approximately 160 km southwest of Williams Lake, or 250 km north of Vancouver. There are two main vehicle access routes into the park, and two campgrounds, one at the end of each route. Both routes take 4 to 6 hours from Williams Lake, though travel time varies considerably depending on weather conditions. Roads are rough, and conditions vary considerably. Drive carefully and with lights on. The nearest communities to the park are Nemiah Valley, Hanceville, Tatla Lake and Williams Lake. No scheduled flights serve the park. Several airstrips are located outside the park boundary; a Park Use Permit is required for commercial air access within the park. Topographical map numbers 1:50,000 92N/1, 92N/8, 92O/4, 92O/5, 92N/9, 92J/13 and 92K/16 cover the park. These are necessary for hikers, horseback riders and other backcountry travellers. Kayaking is popular on Chilko Lake. Canoeing on Chilko Lake is not recommended. At all times horses and hikers have priority. Please view the attached map for the different Ts’ilʔos Management Units [PDF]. The backcountry of Ts’ilʔos Park is recommended for experienced travellers only who are equipped for trail finding, first aid, and survival situations. Hiking routes are not maintained and there are no facilities. There is horseback riding at this park, although trails are neither maintained nor marked. Tsylos Park Lodge offers a number of recreational opportunities in this park (including horseback riding expeditions, hunting trips and flyfishing). There are no lifeguards on duty at provincial parks. There is no developed sandy beach, and the water is very cold. It is possible to crosscountry ski and snowshoe in the park, however, there are no set trails. A concrete boat launch is available for trailerized boats at Gwa Da Ts’ih, while a natural launch, suitable for cartop boats, is located at Nu Chugh Beniz. Cold water pumps are found in the campgrounds. This park has a day-use/picnic area at Nu Chugh Beniz Campground only. There are a few picnic tables in this area. This park only has pit toilets located at the campground. There are no flush toilets. This park offers vehicle accessible campsites on a first-come, first-served basis – campsite reservations are not accepted. There is a variety of shaded, treed, and open sites at each campground and parking is available for extra vehicles. The Nu Chugh Beniz campground has 16 camp sites, 1 of which is a large pull through, 3 double, and the rest are single vehicle sites. There are also 4 tent pads at this campground. At the Gwa Da Ts’ih campground there are 8 single vehicle sites. To reach this small, rustic campground at the north end of Chilko Lake, take Highway 20 to Tatla Lake, then drive 63 km on a gravel road from Tatla Lake to the Gwa Da Ts’ih campground. Follow signs for Chilko Lake. Lodges nearby may offer meals and some basic supplies. This very scenic but often windy campground on the east side of Chilko Lake is accessed via Highway 20 to Hanceville, then 121 km on gravel from Hanceville via Konni Lake and the Nemiah Valley. Supplies are available near the campground at the Nemiah Valley Tl’ebayi Community Centre: gas, propane, laundry and internet service. These campgrounds run on a self registration system and drop boxes are in place so people can pay their overnight fee. There are no payphones at either campground. The closest store to the Nu Chugh Beniz campground is at Nemiah Valley Tl’ebayi Community Centre or at Hanceville. The closest store to the Gwa Da Ts’ih campground is at Tatla Lake.